Are you a roofing pro? Add your listing. Professional Roofing Contractor	Delmarva Metal Roofing - Roof Install & Roof Repairs - (302) 858-1699 Apex Exteriors, Inc. Licensed & Insured - Roofing, Asphalt Shingle Roof Install, Asphalt Shingle Roof Repair, Flat Foam / Single Ply Roof Install, Metal Roof Install, Classic Metal Roofing Systems & IB Roofing Systems. Serving all Kent County DE. : Dover, Magnolia, Viola, Frederica, Felton, Little Creek, Hartly, Camden Wyoming, Woodside, Kenton, Milford, Dover AFB, Cheswold, Harrington, Houston, & Marydel. Clean Site. Done Right. On Time. Free Estimates. Qualified financial contracting available. Licenced & Insured | Free Estimates. Appointments required for estimates. 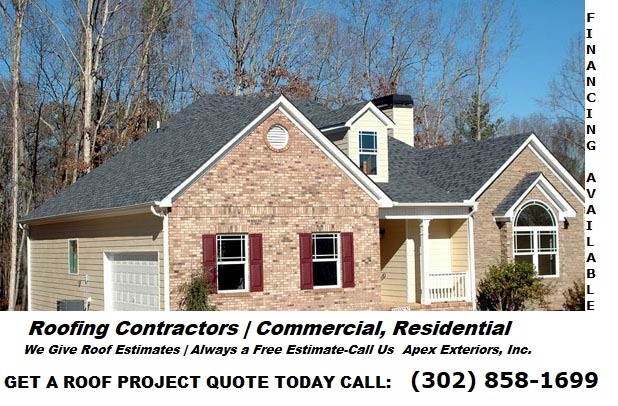 **Apex Exteriors, Inc, Milford, DE holds a Contractor Resident license according to the New Castle County license board. Their license was verified as active when we last checked. If you are thinking of hiring Apex Exteriors, Inc, we recommend double-checking their license status & insurance status with Apex Exteriors, Inc. or with the license board. Roof Service Area: Dover, Magnolia, Viola, Frederica, Felton, Little Creek, Hartly, Camden Wyoming, Woodside, Kenton, Milford, Dover AFB, Cheswold, Harrington, Houston, Marydel. Areas of New Castle DE & Sussex County DE. A healthy roof helps to improve the curb appeal of your home and property investment. We are able to take on any task to help improve the curb appeal of your homes roof. When you want the job done right, we are the one to call! We have been professionally repairing roofs or installing new roofs for over 20 years. Apex Exteriors, Inc. offers high-quality products, but most importantly, professional roofing services. Delaware metal roof Installer & review types of metal or steel roofing available. Roofing repair & roofing installed Service Area: All Dover Delaware 19901, 19904,19903, Magnolia 19962, Viola, Frederica, Felton 19943, Little Creek, Hartly, Camden Wyoming 19934, Woodside 19934, Kenton, Milford 19962, 19963, Dover AFB, Cheswold, Harrington, Houston,& Marydel. Beach Home Storm Roofing Repair Service from zip code 19901 to zip code 19978 Milton, DE. Dewey Beach Area, Bethany Beach Area, Lowes Beach Area, Slaughter Beach Area & all of Rehoboth Beach Area. We install boardwalk like decks to beach homes. Inquire if interested in installing a nice deck for your beach home.